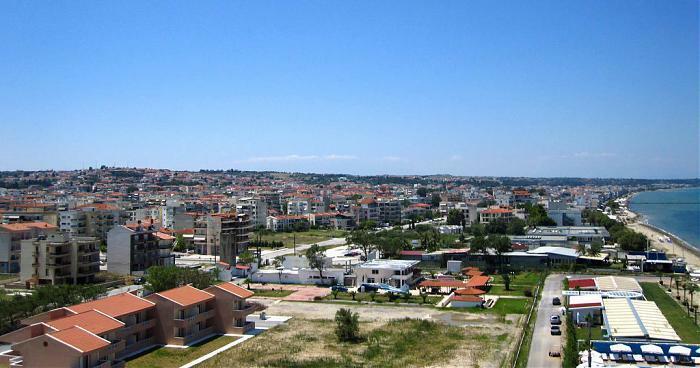 Perea – The Natural Resort Of Thessaloniki. Located only 20 miles from the center of Thessaloniki the second largest city of Greece and only 10 miles from the airport SKG ” Macedonia” is spoted as the best place in north Greece for an all year touring around the area from Halkidiki and Mount Athos, to Kerkini lake and the known natura regions, to Vergina and Pella to Mount Olympus and next to a large exciting city as Thessaloniki. A combination of relaxation, fun, nature and history.It has over a dozen regulated crystal clear beaches, 2 Natura regions (Epanomi and Angelochori lagoons) with 178 rare and protected bird species.The best known beaches are “Potamos”, “Fanari”, “Ageladariko”, “Angelochori Beach”, “Agia Triada Beach”, “Baxe Beach”, “Perea Beach”, which are bustling with beachgoers in the summer months enjoying a swim with a view of Mt Olympos and only few minutes from the nearest Halkidiki beaches.